Information for VACUU-LAN® Networked Vacuum. 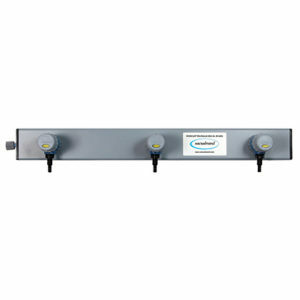 Fully customized modular network can be integrated into lab furniture and lab hoods. Powered by VACUUBRAND chemistry-design vacuum pumps. Long-term flexibility. VACUUBRAND's innovative VACUU•LAN® Local Vacuum Network technology is changing the way labs get their bench vacuum. Instead of the 100-200mbar (75-150 Torr) vacuum typical from a central vacuum system, VACUU•LAN® networks can deliver vacuum down to 2mbar (1.5Torr) to bench vacuum ports. Vacuum is provided locally by a quiet, oil-free VACUUBRAND® pump, so there is no interference or risk of cross-contamination from other labs. The system is completely modular; add vacuum one lab at a time, extend capability as needed, and even interchange vacuum ports - from the simplest manual controls to advanced electronic control on your bench vacuum ports! Far more than a "small central vacuum system", VACUU•LAN® provides performance that approaches that of individual diaphragm pumps dedicated to each application, but with less bench space, noise and cost. A modular design allows for easy reconfiguration, upgrading or even relocation. 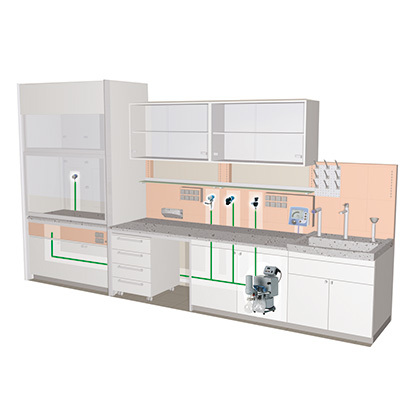 VACUU•LAN® systems can be installed in new laboratories, or retrofitted into existing ones. VACUU•LAN® is also popular for lab rebuilds and science parks. Because each VACUU•LAN® is custom-designed to fit your laboratory and its specific vacuum needs, to obtain more information about VACUU•LAN®, contact BrandTech®.